aw, this episode was so much fun to film last year! 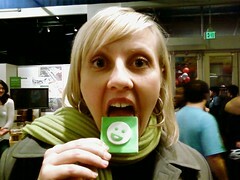 too bad Eddie and I won't be at MacWorld this year, instead we'll be at CES. but you can enjoy this episode from last year. and Veronica Belmont and I have a special coming out for GETV about the WoW patch! 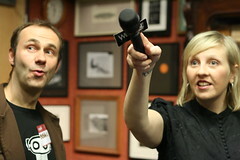 check out the back of our getv mic signage -- still on the back of a webzine sticker! LOL. b.d. solis took this of me and eddie last night at the Yelp holiday party. 2. i was born in kazakhstan even though my birth certificate says leningrad, soviet union (so that place no longer exists anyway) because my mother fixed it (she was a doctor) since it was better for me and my sister for our futures if it looked like we were born in "white" russia instead of kazakhstan. but we were born in kazakhstan. 3. i've seen every episode of forensic files and about a month before GETV was picked up by podtech was considering going to school to become a homicide detective. 4. unless you knew me in 1993 and earlier, you've never seen me drunk. 5. i'm only half jewish. the wrong half. 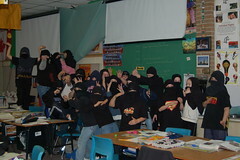 A teacher had his class dress up as ninjas. What a teacher!